As usual, when I’ve fallen off the tracks of blogging, I can be relied upon to clamber back on the rails by posting a sermon. I was up today at the cathedral, at the end of a positively mad week of work (meetings, appointments, changes in plan, changes in room expectation, form-filling-out, et cetera). This week will be mad, too, in different ways: Teaching begins, Margaret and I will go offer our biometric features to the Home Office, more meetings, midweek worship for both the Kirk and the Episcopal congregation at the Uni, and so on — but I’m not preaching next week, so that’s a relief. Today’s sermon came out in a rush in the preparation stage, but when I preached it I wasn’t sure how it went. A number of people offered favourable assessments, though, so it probably didn’t harm anyone. It proved difficult, wen I thought about James, to avoid giving a fascinating lecture on the intricacies of these verses — the curse of the commentary hanging over me. That, and the oddity of me preaching on a text warning against becoming a teacher (or preacher), combined to balk some of my compositional impulses. Anyway, the sermon is below, in the ‘More reading’ section. Margaret and I are writing overdue notes to family and friends, and preparing our lectures for next week. The weather in Glasgow has turned markedly autumnal — not inappropriate for the season, but a decisive end to a never-fully-convincing summer. Three months till the days start heading back in the correct direction. Now, I don’t endorse this example uncritically! There’s plenty I would change about it. But here someone has manifestly thought about just what to put onto a one-page overview of the biblical book. Type, layout, and exposition have to work together to compose an effective tool for learning. 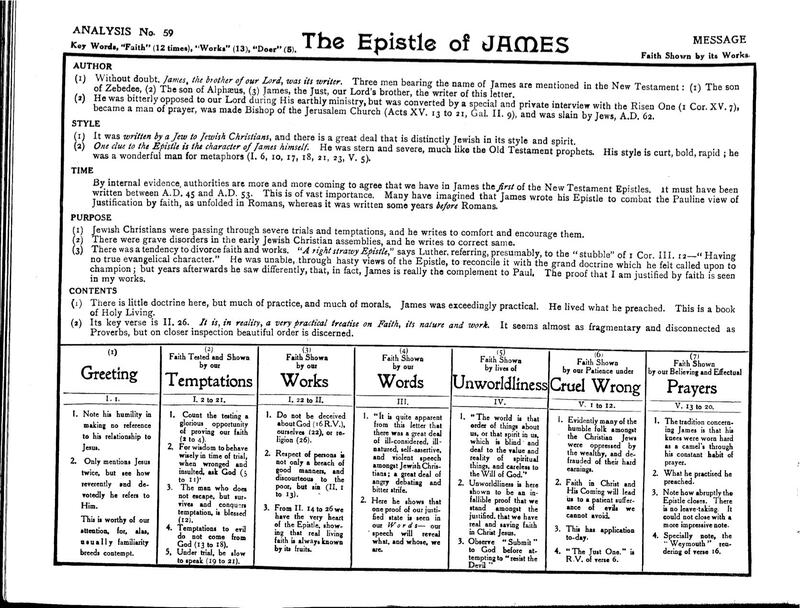 (Witness likewise the famous Larkin Bible Charts, which add such persuasive force to dispensationalist theology.) And if one were to read James with this outline page in hand, or in memory, one would likely derive greater satisfaction from one’s reading (albeit an unsatisfactory satisfaction, from my perspective as a 21st-century critical scholar of James). The Outlined Bible suggests that there’s no reason that design and teaching might not be allied in teaching materials for biblical studies. Instead, though, most of us produce words about words, a dessicated, immaterial, invisible alternative to visible, tangible, pedagogical rhetoric. It wouldn’t cost any denominational body much to put together a decent scholar and a decent designer to produce teaching materials to make a visual argument for sensible theological, biblical, ethical, historical learning. That’s what lay behind my Theologians Trading Cards (hat tip to the Revd Prof. Steve Lahey for the art) and the Early Church History ‘Top Trumps’ card game. I’m not holding them up as the best anyone can do — far from it! (though I’d put Steve’s drawings up against any pro’s) — but underscoring that we’ve got to make the effort. Come on! It’s registration week for first-years here in Glasgow, and amidst all the ordinary hustle and bustle of academic September, I’m serving s an Adviser of Studies for the College of Arts, so I’m hosting a torrent of eager beginning students (at least one of whom claims to have read my blog — Hallo, Peter!) and helping them select their courses for the year. That leaves less time for finishing the essays I was working on, preparing the courses I’ll be teaching, and blogging. So as to catch up from tabs I left open intending to blog about, though, here’s an item that Boing Boing posted the other day — John Entwistle playing the bass part of the Who’s ‘Won’t Get Fooled Again’. On long drives, or even just sitting by the stereo in the dining room, I used to instruct Nate, Si, and Pippa to listen to Who tracks not just for Roger’s vocals or Pete’s notorious power chords and lyrices, but for the hair-raising rhythm section of Keith Moon and John Entwistle (‘Listen to that! Did you hear that? Let me play it again’). About Moon, all that has been said over the years still falls short of capturing just how remarkably he combined unconstrained energy and elegant finesse, furious propulsion and subtle delicacy. He alone would have made almost any band outstanding. When he and Entwistle collaborated at the drums and bass, though, the effect was all the more breath-taking, as Entwistle played a more fluent, more melodic bass than most players’ lead guitar lines — all very much in the background, rarely moving in front of Townshend’s raucous guitar and lightning synthesiser parts. I suppose Entwistle’s ear for brass inflected his bass playing, but when one pays attention to the work that he and Moon together contribute to the Who’s best work, it’s hard to resist the conclusion that (brilliant as Townshend may be, and outstanding a vocalist as Daltrey was) the front men wouldn’t have soared nearly as high without the tremendous work of John Entwistle and Keith Moon. Second, Dean Allen is a mensch. A long time ago, way before Kickstarter, Dean got fed up with his hosting provder, and resolved to start a web hosting service oriented in the first instance to bloggers. He called it Textdrive, and it would include the availability of Textile and Textpattern, his own blogging/formatting systems, and it would be reliable and attentive to users’ needs. He didn’t have the cash to start such a thing, so he invited supporters to pool their money and start him in the business, in exchange for which his service would offer a lifetime of web hosting.The VC 200, as he called them, would fund his start-up, and he would reward them not with fat checks or investment shares, but with exactly what he himself wanted from a web host: service. He succeeded, to the extent that after a while he could sell his company to a bigger company (as one does), and the VC 200 were brought along as customers of Joyent. We were treated pretty well, though it was certainly different from being Dean’s original backers. It felt more as though we were legacy customers, just like any others, though with a more onerous contract. Eventually, a couple of weeks ago, Joyent sent out the message that ‘lifetime’ means ‘until we decide it’s too much bother’, and informed the VC 200 that we were being end-of-lifed (in exchange for one year of cloud-based web services, woo-woo!). Allen’s original supporters gnashed their teeth; Trevor started a Facebook page for the spurned VC 200; Bad Publicity ensued. Then Dean Allen strode out from the wings, assuring all that he would back up his word and keep the VC 200 alive on a rejuvenated Textdrive. This is a person, this is not a company, but he’s a man of his word, and he resolved to take on the burden of supporting those who had helped him get his own venture off the ground. No one wanted something for nothing — they just wanted the promised share in the benefits that accrued to Textdrive, and then Joyent, as a result of their initial investment. Dean stepped up to do the right thing, and as a once and future member of the VC 200, I tip my hat to Dean, and wish him all the best. Last week, as I said, was a bit of a madness — the high-tension, high-stakes visa application wiped out the first bit of the week, and Margaret and I spent the weekend fine-tooth-combing her book manuscript (interrupted by the new Doctor Who episode yesterday night). I keep saving tabs to comment on, from The Last Psychiatrist’s partly-off-target salvo at Harvard’s cheating scandal, to my classmate Larry Lindsey’s (partly) off-target observations on the US financial situation, to anything about the Republican National Convention (but I closed all those tabs in incredulity). But I’m not sure I’ll get to any of those, because tomorrow begins the week that first-years come and register for their classes, and I’ve been prevailed on to serve as Advisor of Studies this year for Theology and Religious Studies. I’m booked wall to wall most days with students coming in at half-hour intervals for me to say soothing things to them while we make sure that they’re taking the mandated 120 credits in three subject areas. Margaret’s book will be really good, and we hope to send it off this week. I have several projects of my own that demand urgent attention, and then there are those first-years. It’s back to respectable clothing on weekdays….